If you’re searching for an affordable alternative for an all-weather cover solution in Brisbane, a custom waterproof shade sail is the perfect solution. Instead of installing expensive structures such as patio extensions or pergolas, instead, why not create an architecturally designed waterproof shade sail. With striking shapes designed to complement the surrounding landscape, a custom waterproof shade sail creates a feature that offers 100% sun and rain protection, all year round. 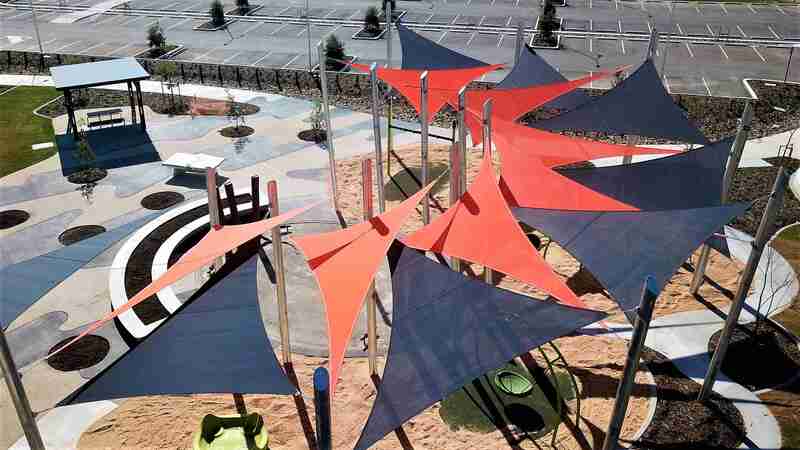 All Modiform outdoor shade sails are designed to withstand the ever-changing Australian climate. From bus stop shelters to carports and pool covers, entrust your shade sail solution to the highly skilled team at Modiform. The main advantage of PVC sails is that they offer total protection from the rain to keep your outdoor areas dry, whilst blocking harmful UV rays and allowing natural light to pass through. One of the most popular waterproof tensile membranes is PVC, treated with specific formulas to protect against UV, weather degradation, staining, and even fire. You’ll often see waterproof PVC shade sails at schools, public spaces, shopping malls, for horticultural shade and commercial properties because they offer affordable alternative protection for large areas. They’re also perfect for protecting your outdoor dining area or carport. Do you need a waterproof PVC shade sail that is not standard in size or shape? Modiform are proud to quote, design and install custom waterproof shade sails to fit almost any size and shape, in a variety of colours and materials. Providing industry leading shade solutions, we create bespoke and fully customised solutions for residential and commercial areas. Waterproof PVC shade sails are architecturally designed and engineered by Modiform to ensure the most practical and appealing shade solution for your property. We’ll work together with you to produce a functional shade solution from your ideas.